It is generally well known that I am not fond of cooking. One thing I do like to fix is homemade soup – chicken, potato, sausage, rice….you name it, if it goes in broth I’ll probably attempt it. Armed with my trusty Hotpoint stove, the only electric stove our house has ever had, I’m fighting tonight’s cold, windy weather with my favorite sausage potato soup. Allow vegetables and broth to simmer. Wash and slice 3 – 4 potatoes leaving the skin on. I typically use either russet potatoes (they hold up better in soup) or Yukon Gold (I like the texture and flavor the best). Add sliced potatoes and browned sausage to the soup. 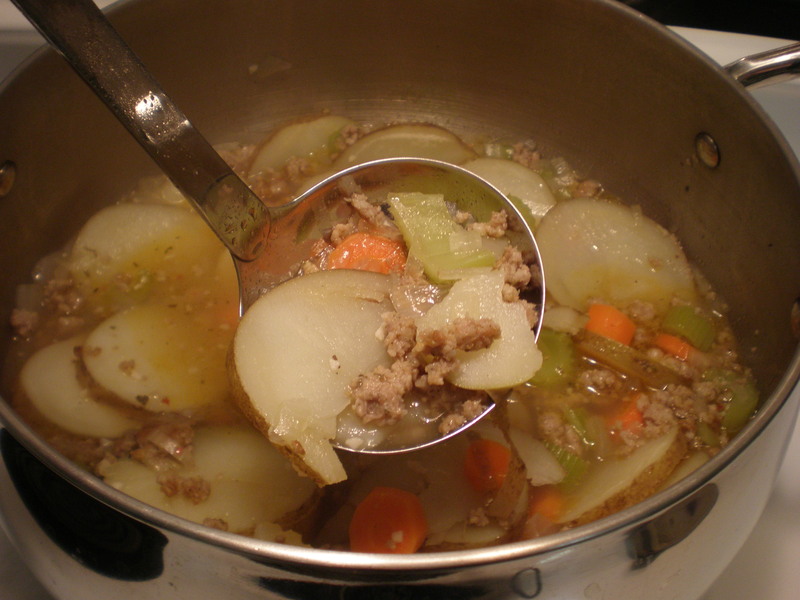 Allow soup to simmer until potatoes are tender – then, you are ready to eat! This is one of my favorite soups to make – it is hearty, tasty, and it reheats well. I’m not the biggest fan of vegetables, so this is also a healthy and sneaky way for me to eat more of them. 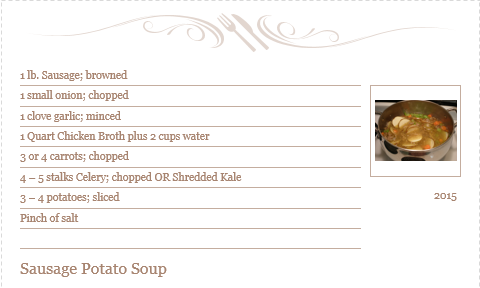 Click the image below for a printable recipe card.